Businesscycle was launched at the House of Commons on 25th October. The project replaces the Cycle to Work Guarantee initiative. The breakfast launch of Businesscycle was hosted by the Department for Transport, Transport for London, Business in the Community, British Cycling and the Cycle to Work Alliance. Speakers at the event included Julian Huppert, MP for Cambridge, and Olympic gold medallist Chris Boardman. BusinessCycle replaces the Cycle to Work Guarantee, an initiative created by the Departments of Health, Transport and Culture in 2009. Speaking at the event, Norman Baker MP, Minister for Transport, who formally announced the rebranding of the scheme, gave a ringing endorsement for the cycle to work scheme and the effect it has had on changing the attitude of both employers and workers to cycling. Mr Baker indicated that the cycle to work scheme was central to UK Government policy on the promotion of cycling. Companies at the launch included NHBC, B&Q and Cycle Solutions. Employers already signed for Businesscycle include RWE npower, BskyB, GlaxoSmithKline, Microsoft, PwC, Ernst and Young, Eurostar, Heathrow, Gatwick and Birmingham Airports and Hutchison Ports. 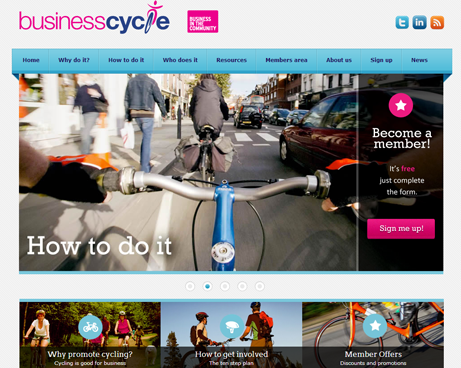 Businesscycle will provide information on cycling, including the health, social, environmental benefits; providing information on how to access cycle training; implementing secure cycle parking and highlighting the importance of good locking practice and bike registration which are often cited as barriers to cycling. TfL’s Director of Planning, Surface Transport, Ben Plowden, said: “The success of the London 2012 Games has spurred on a huge growth in cycling across the country. At TfL we want to nurture that growth and encourage more people to take to two wheels as a means of transport for both leisure and work. Stephen Howard, Chief Executive of Business in the Community, added: “For the past three years, through its ways2work programme, BITC has been working with businesses to influence sustainable commuting and business travel.